This article is about the British journalist and political activist. For the Canadian composer, see Chris Harman (composer). Chris Harman (8 November 1942 – 7 November 2009) was a British journalist and political activist, and a member of the Central Committee of the Socialist Workers Party. He was an editor of International Socialism and Socialist Worker. Born Christopher John Harman into a working-class family, he attended Leeds University (where he joined the Socialist Review Group in 1961) and the London School of Economics (LSE) where he began (but did not complete) a doctorate under the supervision of Ralph Miliband. He was instrumental in publishing the magazine of the LSE Socialist Society, The Agitator, and was a leading member of the International Socialists (as the SRG had become) by 1968. He was involved in the Vietnam Solidarity Campaign and outraged many leftists when, at a meeting in the Conway Hall, he denounced Ho Chi Minh for murdering the leader of the Vietnamese Trotskyist movement, Tạ Thu Thâu, in 1945 after crushing the workers' rising of that year in Saigon. His main role in the IS (from 1977 the Socialist Workers Party, or SWP) was as a theorist and he produced numerous books and articles on a wide variety of topics. Almost all his writing appeared in the publications of the IS and SWP or has been published by related publishing houses, such as Bookmarks. He was first editor of Socialist Worker in 1976-77 and returned to the role after a break in 1982, remaining in the post until 2004, when he started editing the SWP's theoretical quarterly International Socialism Journal. Harman's work on the May 1968 events in France and other student and workers' uprisings of the late 1960s, The Fire Last Time, was recommended by rock band Rage Against the Machine in their album sleeve notes for Evil Empire. 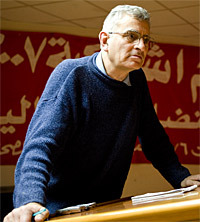 Harman died on 7 November 2009, following a cardiac arrest while lecturing at the Socialist Days conference of the Center for Socialist Studies (CSS) in Cairo, Egypt. He is buried in Highgate Cemetery, London, a few yards from Karl Marx's tomb and adjacent to his comrade Paul Foot. "The State and Capitalism Today"
"The Summer of 1981 – a post-riot analysis"
"Women's Liberation and Revolutionary Socialism"
"The Myth of Market Socialism"
"Engels and the origins of human society"
"The Prophet and the Proletariat"
"The workers of the world"
"Gramsci, the Prison Notebooks and philosophy"
^ According to Harman’s own testimony on his blog. Wikimedia Commons has media related to Chris Harman. "Taking Apart the West," Richard Seymour reviews Harman's People's History of the World in New Statesman, July 2008. Obituary by John Molyneux, The Independent, 19 November 2009. Obituary by Alex Callinicos, Socialist Worker, 9 November 2009. Obituary by Michael Rosen, The Guardian, 9 November 2009. This page was last edited on 27 August 2018, at 00:13 (UTC).